-Fortuna (wild) only appears on reels 2,3 and 4 substitutes for all other symbols axcept scatters. -All symblos pay Left to Right except scattered idols,which pay any. --Win on fifferent lines from each bet line start on the left side. -Maximum win per paid spin is 40,000 times bet per line. 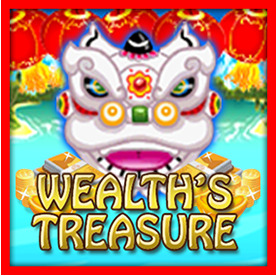 -In Wealth's Treasure game, the bonus round consists of free spins. Wen 3,4 or 5 scattered Idols appearing anywhere triggers 5,15 or 25 free games respectively. Each scatterappearing during free games awards a BONUS PRIZE equal to the triggering bet. -Only appears in the free games,1 to 5 scatters appearing in the feature award 1 to 25 additional free games respectively. -Free games are played at the lines and bet of the trigger game and all prize except the Bonus are TRIPLED. -A Progressive Jackpot can be won at the conclusion of any game. The Jackpot is triggered at random. Progressive Jackpot win are added to other wins.